In the glade will lie a town, buildersâ€™ wagons circle round. In the carts go goods they need, wheat and wood and brick, you see. Then with these from wagon there, they raise a house near village square. When their buildings all are placed, The town hall will they then raise. The GAME- Each player has a set of buildings to place. Placing a building uses an whole wagon load of resources: 1 each of wood, bricks, and wheat. The roll of the die determines how far the wagons will move. When any child stops beside a resource that they need, they can load the resource into their wagon. When your wagon is full, you get to build a new house! The house must be placed in the right spot in the village. Then the resources are returned to the board so they can be collected again! After you build all your houses, you begin collecting resources again to build the Town Hall. The player who builds the Town Hall wins the game! 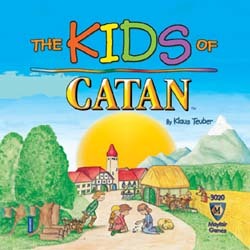 Of course, children are also encouraged to play with the wonderful wooden buildings by themselves, and to create their own games and adventures in Catan!